freely downloadable, with free offer. 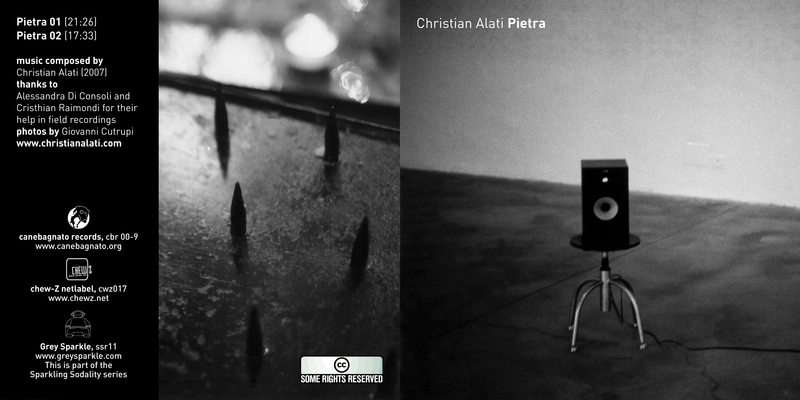 Pietra is the debut album of Christian Alati, recorded in 2007 in his recording studio (Codhouse). A complex and intense work, divided into two different but complementary tracks, introduces into an ipnotic and unreal dimension with a gradual pace. Monolithic in its funereal gait, it rarely concedes and digs from the inside to the inside. The chords are drifted into silence; noises, distant sounds are recreated into infinite spaces depending on the listener availability. Pietra is not an album that you can love or hate, but it’s an album that loves and hates you. Thanks to Alessandra Di Consoli and Christian Raimondi for their help in field recordings. Pietra is a special release in joint venture with Canebagnato and Chew-Z. This work is licensed under a Creative Commons License: Attribuzione-Non commerciale-Non opere derivate 2.5 Italia.